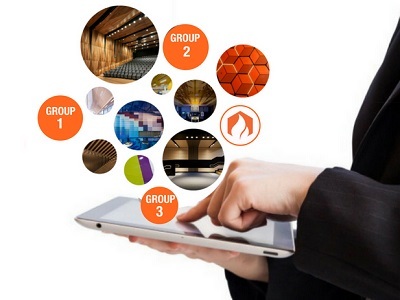 Atkar Group has introduced a new online calculator designed to assist architects and designers quickly and accurately find the correct Fire Group Rating for wall and ceiling linings to be used on their projects. As a leading acoustic wall and ceiling manufacturer for over 70 years, Atkar Group is constantly innovating to simplify the design and construction process for their customers. Their latest innovation is the online Wall & Ceiling Lining Material Group Rating Calculator, which has been developed based on direct feedback from their customers. Atkar Group General Manager Tom Devine explains that their customers constantly seek support to help them identify the Group Rating required for lining materials. The National Construction Code Building Code of Australia (BCA) Amendment 1, Vol 1 outlines the minimum group rating requirements in Deemed-to-Satisfy Provision Specification C1.10; Atkar’s Group Rating Calculator uses the exact data from this specification. According to Devine, the Group Rating Calculator does not replace the BCA specification but has been designed to make it very easy to use. People can search by Class Number or Building Classification, and access all the support documents needed to help identify the accurate result. Aware of the importance of using the correct Group Rated product in every application, Atkar Group works very closely with all their clients throughout the whole design and construction process to ensure that the lining material selected not only achieves the architect’s design vision but also meets the required fire compliance. “We have a very rigorous Fire Testing program in place to ensure that our products are tested to the most current standards. We have an abundant amount of Fire Rated products within our acoustic lining range, and more still to come,” states Devine. This new calculator follows on from Atkar Group’s recent launch of their new Architectural Linings & Claddings range, which offers non-combustible and fire rated lining and cladding solutions. To view the Wall & Ceiling Lining Material Group Rating Calculator please visit Atkar’s website.